Summary: This book (part 1 of 2) is part of the Grisha universe and takes place after the events of the Grisha trilogy. (You can read my reviews for all of them here.) 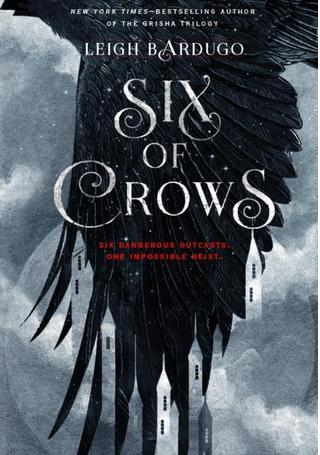 You don't have to have read the Grisha trilogy in order to understand Six of Crows, but I recommend that you do - you get a more detailed understand of the world and the stakeholders. In the small island country of Kerch, the main city of Ketterdam is ruled by a number of different gangs, and making a name for himself among them is Kaz Brekker, the criminal prodigy lieutenant of the Dregs. At the young age of 17, Kaz is already a legend, with his cane and his leather gloves, which only serve to further enforce his nickname of "Dirtyhands." A new drug is making the rounds in the criminal underworld, one that amplifies Grisha powers far beyond what was previously thought possible, but that leaves them quaking with addiction. It's a dangerous drug, one that could lead to world destruction if it were ever mass-produced, and the one man who has the knowledge to produce it has been taken into custody by a rival nation, into the most high-security prison of the entire continent. And rather than sending in soldiers and diplomats to retrieve him, Kerch's leaders turn to... Kaz. But it's a pretty big "if," especially when they're not sure if they can even get through this mission without killing each other. So of course, I LOVED this book. LOVED IT LOVED IT LOVED IT. It was everything I thought it would be - a fun, fantasy heist story - and more. Especially Kaz - it's one thing to stay ahead of the mark, but it's another thing to stay ahead of the reader, and there were definitely moments where I was fooled. I found myself having to stop and reread passages often, to try and figure out whether they really WERE in trouble, or whether Kaz had planned things that way (and when they really were in trouble, I would wonder whether Kaz would be able to find them a way out). 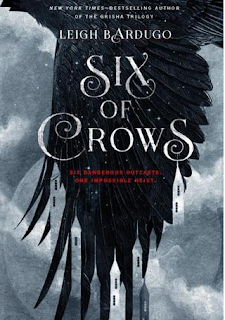 I felt like this world and this story were much grittier and more brutal than the Grisha trilogy - far darker than Ocean's Eleven ever was - but it was such an amazing story that I was not ready for it to be over. (I literally wasn't ready - my Kindle said I had 15% left in the book, but lo and behold, it was actually a preview for Shadow and Bone that began on the next page. *angry*) This book does end on a cliffhanger, so be forewarned. And the second part, Crooked Kingdom, comes out at the end of September.